Today, we’re excited to publish this guest post by Laura Swallow from The Pink Herbivore. She’s an at-home vegetarian, devoted/obsessed wife, mommy-to-be (check out her baby pool here), experimental chef, Jesus lover, occasional crafter and amateur photographer from Wichita, Kansas. If you’re interested in writing a guest post for the Belly Blog, email Mollee. 1) Wear shirts that are “strategically loose” or just tight all together. The clingier the fabric, the better. If you wear a shirt that is loose all around, you might end up looking just a little chubby instead of like you have a little passenger on board. 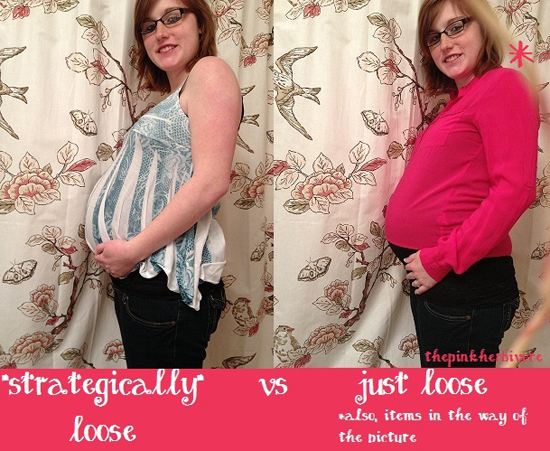 If it’s “strategically loose,” it will shape your girls and come out looser right on top of your bump. An empire-waist top is a good example of this. Note: If you’re like me, and you’re not a huge fan of the new “outie” belly button you’ve obtained, try wearing a tank top or camisole under tight shirts. The extra layer of fabric will conceal it most of the time! 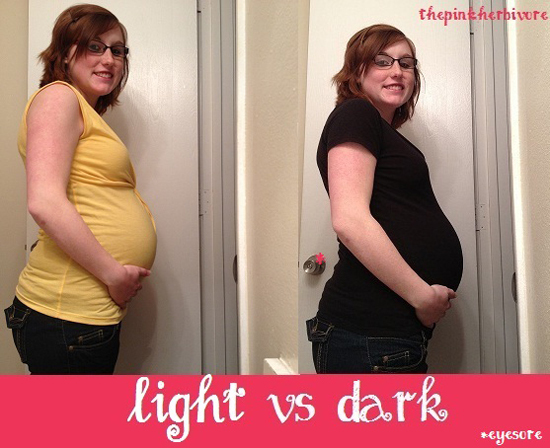 We all know that dark colors like navy and black work well to conceal that extra five pounds we put on over spring break, but you have to remember that they do the same with your baby belly. The lighter the color, the less is hidden in the dark folds of the fabric. However, if you have a darker top that you’re just dying to wear, you can help it out by placing your hands at the very bottom of your belly. That will bring out the contrast of the belly against your hips. When your pelvis and legs are looking skinny, your belly looks rounder and more prominent. 1) Make sure you are angled toward — if not completely facing — the side, and smile. The side view is definitely the most flattering and revealing of your bump. 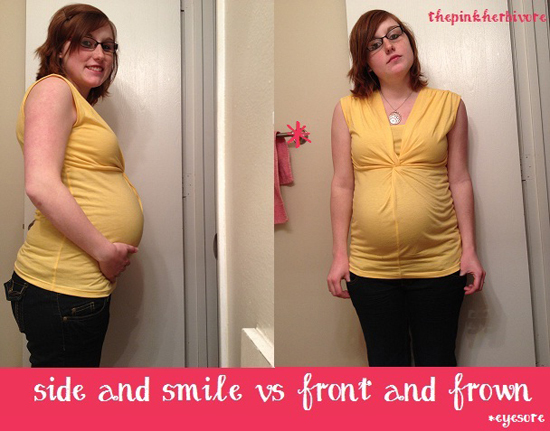 If you face the camera straight on, your bump tends to get absorbed into the rest of your torso. And while the overall focus is your belly, but it’s nice to have a pretty smile in there, too. 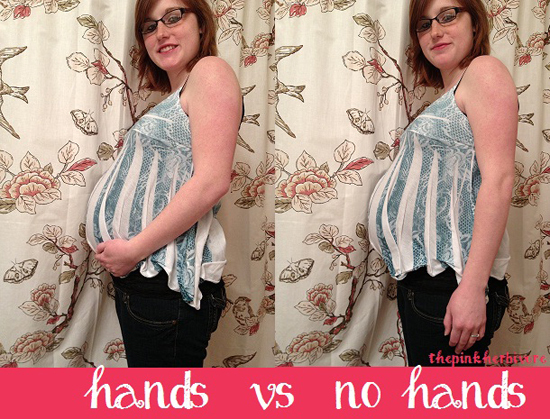 2) Have your hands holding your belly or on your hips. If they hang at your sides, it will most likely look awkward and unnatural — not to mention, it will take the focus away from your belly. 1) Make sure that your whole torso is in the frame. You’re going to want your whole belly showing off as proof of the little squishy that’s growing inside of you. 2) If someone else is available to take the picture, ask for help. My husband is by no means a photographer, but he gets the job done in fewer shots than when I take the picture myself. As long as your helper can get you in the frame, you can always go back and crop the picture the way you want in a simple software program like Paint. 3) If no one else is available, use a timer. I use my iPhone for all of my maternity pictures because it’s readily available, and it’s a lot less work to upload and edit than if I use my Nikon. I downloaded a timer application that lets me set the time and number of pictures to take before stopping. (I use a delay of 10 seconds before it takes four pictures, each a second apart.) This gives me a chance to have several pictures in the same position with potentially different/better expressions. For example, I might be in a position I really like, but sometimes my smile looks more relaxed by the last picture. Note: Find a good, sturdy place to set your camera. You’ll want it to be where you can see how you’ll look from that angle and easily take many pictures without moving it much. Any place goes! I set mine anywhere from a chair arm to a jar full of seashells in my bathroom. 4) Take the picture in front of a pretty or clean, plain background. You don’t want your laundry basket full of dirty clothes or that pile of dirty dishes forever etched in the memory of how you looked at 27 weeks pregnant. A lot of the time, I take pictures in my bathroom because I have a mirror, things to position my camera on, and a clean white door. I’ve also taken pictures in front of my shower curtain or with fabric hanging from a door as a background. 5) Make sure there is good lighting. Natural daylight always trumps the yellowish hues of indoor lighting. However, if you have to take a picture inside, or it’s dark outside, turn on as many lights as you can to even out the lighting or go to a well-lit place such as a bathroom. That’s pretty much it! I know it might sound a little complicated, but once you get started, it’s a piece of cake! Great post! Thanks for sharing! Hope I can use these tips soon!